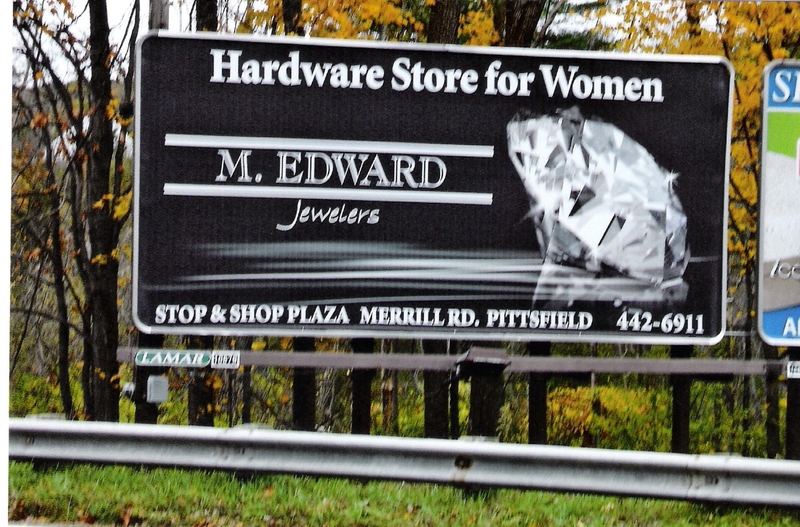 It reads: “Hardware Store for Women,” with a photo of a big, huge diamond and the name of the business: M. Edward Jewelers. “Wow, that’s a sexist ad,” I said. “That’s exactly what I was just thinking!” my mom responded. The implication that women have no place or interest in actual hardware stores — you know, the ones with hammers and nails and duct tape — is preposterous, of course. I was just in a real hardware store the other day, picking up flashlights and screws for Occupy Boston. When I think of hardware stores and women, I think of my mom buying canning supplies, gardening tools, and chicken wire. I think of Mimine, a 30-year-old woman who is the lead construction engineer at the building site of the eco-village the Papaye Peasant Movement is creating in rural Haiti. It makes me sad — and, yes, angry too — to see a local business using old, tired gender stereotypes to try to sell its products. Even if I were interested in buying a diamond, I’d choose another place to do so after seeing this ad. But really, I much more need a hammer than a diamond, thank you. I’ll be posting more about Occupy Wall Street and Occupy Boston soon, but quickly, here’s the letter I just e-mailed to Mayor Menino. Voice your support! You can call him at 617-635-4500, or e-mail him at mayor@cityofboston.gov or via the city’s website. I’m writing to vocalize my support for Occupy Boston and to strongly urge you to respect the protesters’ constitutional right to peaceful assembly. They are using nonviolent action to call attention to corporate greed, to undue influence of corporations on the political process, and to the sickening gap between the wealthiest 1 percent and the 99 percent that have been disenfranchised by this country’s broken systems. Occupy Boston is what democracy looks like. This is nonviolent collective action at its best. Wow, it’s been awhile. What the heck have I been doing? Well, I guess there’s work. And union stuff. And volunteer stuff. And live-music adventures (that blog needs updating, too). And awesome friends. And some travel. And exploring Boston. So, in two words (yes, two words): a lot. But I’m going to make an effort to stop by here more often. It feels important. Or if not important, useful. I’m aiming for baby steps. So, for now, I’ll just say: hello!